The 50' American DJ Accu-cable 3-pin DMX Cable is designed for connecting DMX controllers, DMX lights, and other 3-pin DMX512 devices into a stage lighting or effect system for live performance applications. The cables are constructed of 22 AWG stranded tinned copper conductors insulated by polyethylene within a PVC jacket. 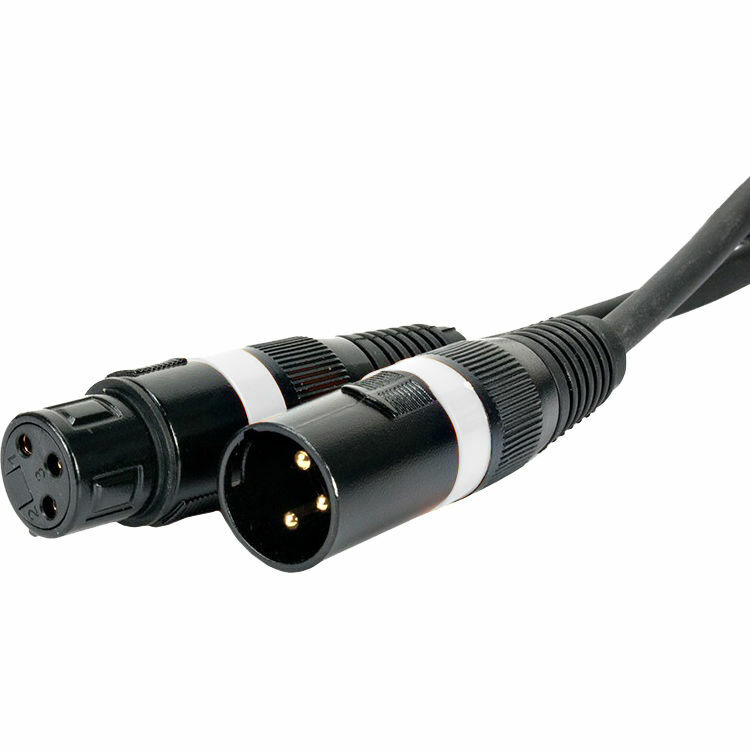 Box Dimensions (LxWxH) 10.4 x 7.2 x 1.4"
Accu-cable 3-pin DMX Cable (50') is rated 4.8 out of 5 by 8. Rated 5 out of 5 by Wink from Nice cables...thick and well built! Cables seem to be built well, I think they are going to hold up well. We get alot of help breaking down sometimes and people dont always treat things gently! I especially like the black ends, all our mic cables are silver. Will be easy to tell them apart/not get them switched by accident. Rated 5 out of 5 by Donald from Great cords and great value. I was looking for black cords to use to power some theater lighting I just installed in our church. This item is exacly what I want as it blends in with the dark wood nicely. They are nice and flexible and easy to work with as well as hang neatly without kinking. Rated 4 out of 5 by Jboone from Good price for a decent cable Good price and decent quality cable. Needed a few extras for the Christmas season and didn't want to break the bank buying them, these provided the perfect solution. Rated 5 out of 5 by PWOOD from Tested and they Work Perfectly Using with Elation Stage Pack Dimmers and Stage Setter-8 DMX Controller. Works perfectly! Rated 5 out of 5 by GiantsFan from Does what its supposed to do Durable, reliable, flexible cable. No connection issues with my Elation system. Rated 5 out of 5 by Greg from Reliable cable Works great. Does exactly what I expect. Rated 5 out of 5 by Thomas from Excellent choice. Works great.